The Supreme Court, in M/s Larsen &Turbo Ltd. v. State of Jharkhand and others held that if an assessing officer agrees with information/objection of the audit party and is not personally satisfied that the income has escaped assessment but still reopens the assessment on the direction issued by the audit party, the reassessment proceedings are without jurisdiction. In a huge setback to business tycoon GopalAnsal whose deadline to surrender expires today , the Supreme Court on Monday rejected his mercy plea in 1997 Uphaar theatre fire case and directed his lawyer Ram Jethmalani to approach President Pranab Mukherjee. The Supreme Court on Tuesday asked why there cannot be an out-of-court settlement to the vexed Ayodhya Ram temple issue saying these were matters of religion and faith. The Supreme Court asked the Centre to explain reasons for which the government chose to close the window allowing all categories of people to deposit old notes of Rs 500 and Rs 1,000 after December 31, 2016, under some special circumstances. Mamata Banerjee government in West Bengal suffered a huge setback with the Supreme Court on Tuesday refusing to interfere with a Calcutta High Court order asking CBI to probe the Narada sting case in which several ruling party leaders of state were allegedly caught on camera taking money. The Supreme Court on Tuesday issued a fresh and last warning to the Sahara Group that it would auction its prime property worth Rs 39,000 crore at Aamby Valley in Pune if Rs 5092.6 crore is not paid by the company by April 17 as promised. A two-judge bench of the Supreme Court, headed by Justice Ranjan Gogoi, referred to a larger bench the petition filed by Senior Advocate Indira Jaising challenging the alleged non-transparent and arbitrary method followed by the apex court in designating senior advocates. The Supreme Court on Wednesday allowed an appeal filed by a 99-year-old convict against his conviction and sentence in a dowry death case. A division bench comprising Justice Arun Mishra and Justice Amtava Roy reduced the sentence to that of already undergone and directed the authorities to release him forthwith. 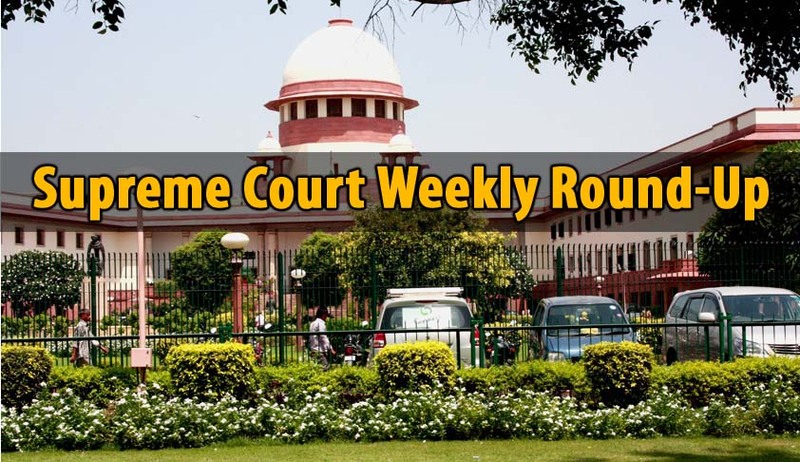 Supreme Court bench of justices Adarsh Kumar Goel and UdayUmesh Lalit, set aside the High Court’s order granting compensation to Barik, accepting the plea of the Orissa Government that it was not responsible for his illegal custody. Chief Justice of India JS Khehar’s bench has upheld the security arrangements made for former Meghalaya High Court Chief Justice Uma Nath Singh and also to Justice T Nandkumar Singh, retired judge of Meghalaya High Court, in terms with the existingthreat perception to them. How the Disciplinary Committee consisting of members, who were not familiar with the vernacular script, could analyse and appreciate the documentary evidence which is in a language not known to them, the Supreme Court has asked while setting aside disciplinary proceedings against a lawyer.